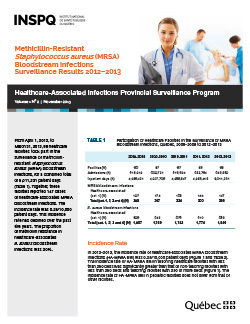 From April 1, 2012, to March 31, 2013, 88 healthcare facilities took part in the surveillance of methicillinresistant Staphylococcus aureus (MRSA) bloodstream infections, for a combined total of 5,011,231 patient days. Together, these facilities reported 147 cases of healthcare-associated MRSA bloodstream infections. The incidence rate was 0.29/10,000 patient days. This incidence rate has declined over the past five years. The proportion of methicillin resistance in healthcare-associated S. aureus bloodstream infections was 20%.